When you are in out of the station.Kennels9 is a Dog boarding facility that gives your dog all the love, care and attention. 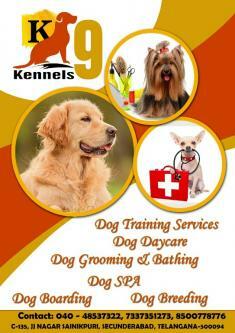 Kennels9 providing the services like Dog Grooming,Dog Daycare,Dog Bathing,Dog Training .Dog home made food services. Kennels9 provides pet care services. Our dedicated professionals make sure to receive your pet all the love and attention in your absence.We are also best nutrition home made food for dogs. Kennels9 provides pet care services. Our dedicated professionals make sure to receive your pet all the love and attention in your absence.